The University of Leeds; England, UK. July 2013. Bachelor of Civil Engineering with Honours Class II Division ii in Building Studies. Longsands College; England, UK. June 2007. 8 GCSE’s grade A-C including English, Maths, History, Science, Geography, IT and Ceramics. 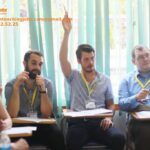 Teaching English, Maths and Science in Vietnamese public schools. Taught students of kindergarten to sixth grade. Made syllabi and lesson plans according to class level.